I am seriously glad that the first photo isn't you, lady ... I thought, "How is she gonna WALK in those GIANT SHOES?" Bwah! I thought the same thing as Sal. 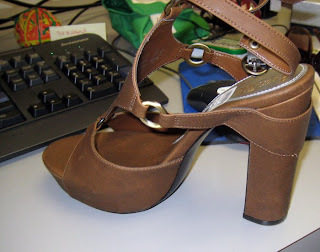 I love those shoes...although my feet hurt just from imagining them. 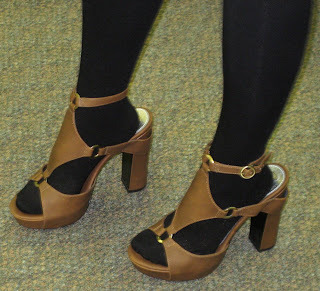 And you know-I actually like the chunky heel. I think it makes the design look balanced. Hi there-wow, they are cheap though!! I visted her store last week and saw those shoes! I love the prices of her store and I met Beyonce while I was there! wow Kira, you had the total nyc celeb experience - awesome! sharon - cheap and i like the straps. lipstick - i agree, I like the heel with the shoe, but i like me some trannies too! wendy and sal - don't worry, i wouldn't sacrifice my ankles for $12! hahaha...i bet he does have pretty ankles though.